Do you need a speaker for your organization? Assistance League of Charlotte’s Speakers Bureau will provide an informative talk for your business or organization at no cost. We are available for church groups, school organizations, civic groups and other service organizations. Presentations average 20-25 minutes; are typically informal, but can include a more formal audio visual DVD of our non-profit organization, if requested. The presentation details how our member volunteers serve youth, children and their families in the Charlotte community through five philanthropic programs. Email info@charlotte.assistanceleague.org to schedule a program today. We will call you to make arrangements. 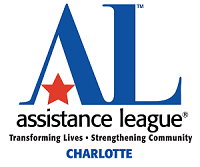 Assistance League of Charlotte is a nonprofit volunteer organization dedicated to improving the lives of children and families through community-based philanthropic programs - we feed, we clothe, we mentor, we educate.